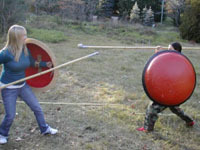 Our goal in Taxeis Plataia is to explore methods of ancient Greek warfare, examine the customs and culture of the period, and to participate in educational and recreational reenactments of life in ancient Plataia in throughout Greece, through recreations of symposia, camp life, and martial arts. In addition, we indulge in a certain amount of scholarship—this winter, we’ll be working on a translation of fragments of Eupolis. 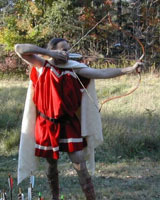 Ancient Greek reenacting is not supported by shops, artisans and craftsmen to the same extent as the late Middle Ages or the late 18th century, and so we have to make almost all of our own equipment. As such, so far the bulk of our hobby time has gone to recreating the aspis (40 hours each), making the chiton and the chlamys, and sandals, and… everything. If you want to look at some of our projects, and some in progress, take a look at the Agora, or visit our website at www.plataians.org. The organization is open to all who have an interest in ancient Greek culture and society. Please contact us for more information, and feel free to join the discussion forum to find out what we’re up to this month.